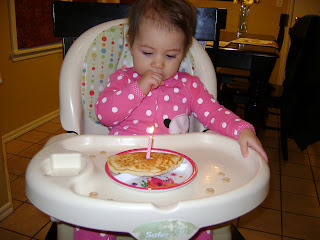 The Alexanders: Bailey Mae is ONE YEAR OLD!!!! 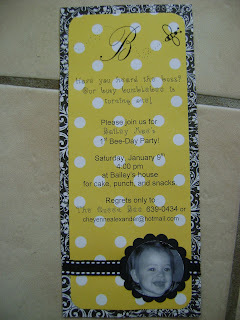 We celebrated Bailey's first birthday with a bumblebee party! I thought of it after so many times of calling her a "busy bee." 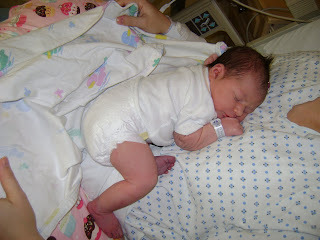 She is the busiest baby I know and gets into EVERYTHING! So the theme fit her pretty well. Here are the invitations we sent out. 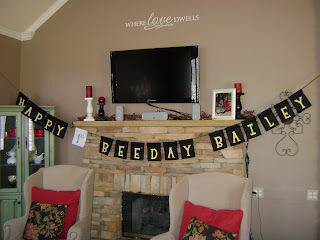 Craig actually helped me make this birthday banner. It was minimal sewing and cutting letters on my Cricut. Craig hung all of these balloons above the island and I thought they looked awesome. 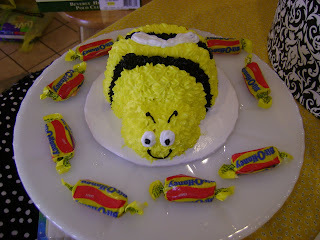 The beehive cake was for all the guests. 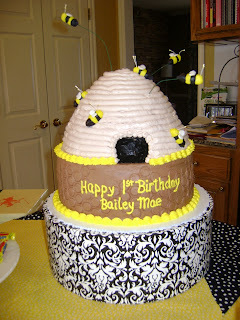 The hive was a yellow cake with buttercream icing and the bottom layer was chocolate cake with chocolate buttercream. The little fondant bees were all around the hive and some were flying on the ends of floral wire. This was Bailey's little smash cake. She LOVED it! 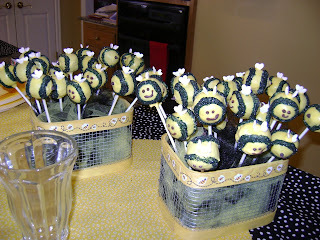 Enjoy looking at these bee cake pops because you will never see cake pops at one of my parties again. :) They were terribly time consuming and not easy. They turned out cute and tasted great, but I just can't justify the time it took next time! 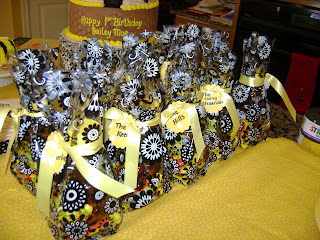 Each family took home a goody bag of honey (what else?) surrounded by some yummy Bit O Honey candy. I haven't had this candy in years and it was SO GOOD! Bailey did great making a huge mess of her cake which is of course what we all wanted to see! Check out these adorable messy cake pics for yourself! 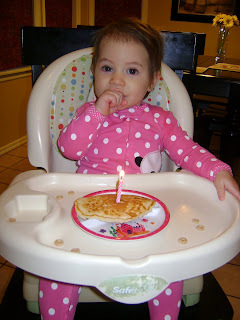 On Bailey's actual birthday which was Thursday, January 14th, Avery and I sang "Happy Birthday" to Bailey with a candle in her banana pancake. Bailey LOVES bananas and calls them "nanas." She could hardly take that knuckle out of her mouth. 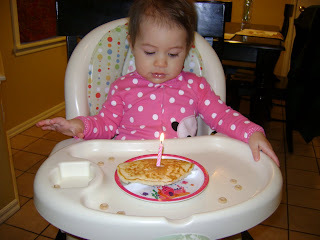 Happy Birthday Bailey Mae! We love you so much!!!!! OH MY GOODNESS CHEYENNE - her party was absolutely adorable. You are so talented and did such an amazing job! I wish I could have seen it all in person. LOVE the decorations. LOVE the food. LOVE the favors. And LOVE the adorable bee outfit. Great job! Oh, and I've done those cake pops before and you're right - they're a lot of work. I made them a year and a half ago and haven't gone there since. 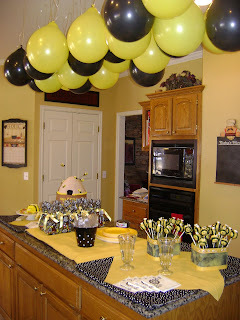 I love the party - so cute! Might have to steal the idea - wish you could make the cake!